Pencils Down, Pass the Remote: Game of Thrones season 3: who will live, who will die? Game of Thrones season 3: who will live, who will die? In preparation for the epic series' third season, I present a speculative list of the characters most likely to die, and those who stand the greatest chance of surviving the next ten episodes. Game of Thrones has gained a reputation as a TV series that doesn't think twice about killing major characters, even when those characters happen to be the lead who was featured in all the promotional materials. The show's "no one is safe" sensibility makes it difficult (and irresistibly tempting) to predict who will be the next casualty. So just for fun, as a newbie who is unfamiliar with the books and therefore blissfully ignorant of the show's next painful twist, I offer up a list of the five characters most likely to follow Ned Stark into the next world, and the five who have the best shot of telling death, "Not today." King's Landing's very own Tommy Carcetti might seem like the consummate survivor; after all, he's the third-smartest character on the show (after Lord Varys and Tyrion), he's demonstrated his craftiness on multiple occasions, and he's always willing to double-cross the losing side (a.k.a., the dearly departed Ned Stark). However, Littlefinger's downfall might be his lust for power. While Lord Varys always manages to keep his ambition in check, Baelish is the sort to be cut down while reaching for the crown. Not to mention that he's now the Lord of Harrenhall, and that locale has never been kind to its owners. Now that Dany has a ship (not to mention some rapidly growing dragons), it seems that her return to Westeros is, if not exactly imminent, at least plausibly on the horizon. In spite of (or, rather, because of) Ser Jorah's love and loyalty when it comes to his Khaleesi, I don't see him ever making it back to Westeros. Love and loyalty are not the sorts of qualities that tend to get rewarded on Game of Thrones. Plus, back in Qarth, we met a cryptic masked woman who suggested that Ser Jorah may have betrayed the woman he loves. All signs point to an unhappy ending for Dany's white knight. I like Shae. You probably like Shae. Tyrion loves Shae, and unfortunately, that might be the kiss of death for the smart, feisty woman who gave her heart to the Imp. Now that Tywin and Cersei have stripped the former Hand of his power, it's only a matter of time before someone manages to hit him where it hurts. 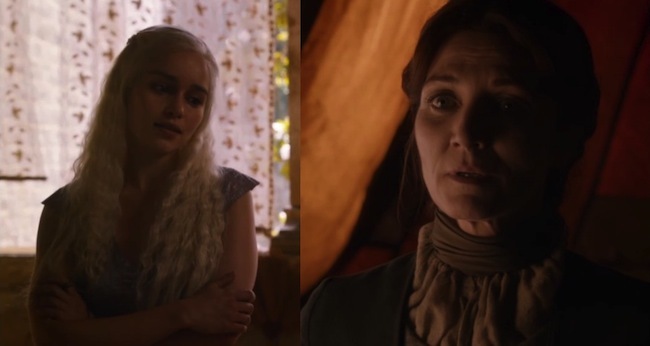 Cersei already tried it once, but mistook Ros (Esme Bianco) for Tyrion's lady love; Tyrion's sister isn't the kind of woman to make the same mistake twice. This one is really just a numbers game. The number of kings fighting for the Iron Throne has already been reduced to four (rest in peace, Renly Baratheon), plus the possible additions of Daenerys Targaryen and Mance Rayder. If the war is going to change significantly (which it has to, if this season is going to keep from getting real boring, real fast) one of the current competitors has to get knocked out of the race. When it comes to the things that count - number of soldiers, availability of funds, the ability to gain allies, screen time - Balon is outmatched on every count. Plus, Balon's death would add yet more tortured angst to Theon's upcoming story, and if there's one emotion Alfie Allen excels at playing, it's tortured angst. The first season ended with Ned Stark's head on a pike. The second ended with Winterfell in flames. If we read Game of Thrones as the story of the Stark children (or at least partially as their story, as it is certainly also Dany, Tyrion and Jon's story), Catelyn's death would be the final step in their hero's journey. Dramatically, it would force Robb, Sansa, Arya and Bran to take their lives completely into their own hands. Symbolically, it would be the ultimate symbol that they no longer have a safe haven to call home. Sansa Stark said it best: "The worst ones always live." Bran (Isaac Hempstead Wright) is clearly just beginning to develop some direwolf-related magic powers, and I suspect he'll live long enough that we'll get to see them in action. Arya (Maisie Williams) is obviously way too much of a badass to die; plus, you don't provide a character with a mysterious phrase that gets her in touch with a face-changing ninja assassin unless she's going to use it. Sansa (Sophie Turner) is developing her own special set of powers - those of a courtier - that will allow her to do what no other Stark can: survive at King's Landing. As for Rickon (Art Parkinson), he's not a real enough character to have screen time devoted to his death. Jon has basically had his own, completely separate story going since the beginning of the series. Yes, other people have been involved - Sam, Qhorin, Ygritte and now Mance Rayder - but the beyond-the-wall plot is essentially Jon's. The sheer amount of screen time that would be essentially wasted were Jon to die is enough to guarantee his survival, at least until the story of the King Beyond the Wall and the White Walker invasion comes to a head. Everything I said about Jon's story goes double for Dany. She's been on her own, participating in a story on a completely different continent, for two seasons now; killing her would mean that all the time the show has spent on her (not to mention the entire season she spent yelling about her dragons) has been a waste. Plus, the book series is called A Song of Ice and Fire; and just as Jon seems destined to be heavily involved with the "ice" part, it stands to reason that Dany and her dragons are going to bring the fire.